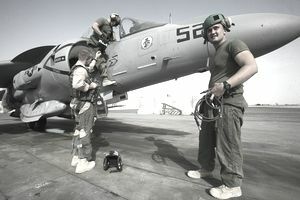 The Marines of the Expeditionary Airfield (EAF) Systems Technicians catch Navy and Marine Corps fighter jets with emergency arresting gear on airfields / airports where jets land for long term maintenance or quick refueling. Not only do they employ, install, operate, inspect, maintain, and repair Arresting Gear Systems, they also do the same with Visual Landing Aids, Airfield Lighting and Marking Systems and Airfield Surfacing System. From catching jets with emergency equipment to sweeping the air field and flightline for damage and debris, the Marines of the 7011 MOS overall ensure a safe landing zone and make emergency repairs. They will also make landing pads for helicopters and prepare for their secure arming and refueling when on station. The EAF technician military occupational specialty have different missions when at home and when deployed. When at home at the airfield, the job consists of aircraft recovery and the 7011s act as emergency personnel. But when deployed the crew of 7011s focus on maintaining the entire airfield from emergency arresting gear, but also the painting and lighting which can number of 2,000 on some airfields and miles of painted lines. Otherwise pilots would not know where to land and take off as well as have emergency landing options when malfunctions occur with tires, landing gear, and other failures. Type of MOS : Primary Military Occupational Specialty (PMOS) means you can be assigned to this type of training immediately out of boot camp training. Rank Range: MGySgt to Pvt - A Marine can make the MOS 7011 a full career of more than 20 years if he/she chooses. Job Description: An expeditionary airfield systems technician employs, installs, operates, inspects, and repairs expeditionary airfield (EAF) systems to include arresting gear, visual landing aids, airfield AM-2 matting and accessories, EAF communications and airfield lighting and marking. In addition, Marines in this field operate, inspect, and maintain emergency arresting gear systems for high performance Naval and Marine Corps Tail Hook aircraft, design expeditionary AM-2 airfield facilities, provide field marker light (FML) systems for Marine Expeditionary Units (MEUs), and conduct tactical/assault landing zone assessment surveys (TALZAS) for Nava: and Marine Corps tactical aircraft. (1) Must possess an MM score of 95 or higher. (2) Vision correctable to 20/20 and normal color acuity. (3) Complete the Marine Expeditionary Airfield Equipment School, NAS Pensacola, FL. (a) Operates and performs preventive maintenance on expeditionary airfield systems. (b) Installs and performs preventive maintenance on AM-2 matting utilized in conjunction with recovery equipment. (c) Installs and performs preventive maintenance on visual landing aids. (d) Follows published safety regulations relative to working near and on a runway and know the hazardous zones. (e) Utilizes visual hard and light signals required in recovery operations. (f) Maintains tools, instruments, and test equipment. (h) Operates vehicles with a rated capacity of at least 5 3/4 ton category. (i) Operates tactical and commercial forklifts and cranes of 4-25 ton capacity. (j) Performs driver operator maintenance and inspection on all types of support vehicles and heavy equipment up to and including those in the 25-ton capacities. (a) Evaluates by test and inspection the serviceability of recovery equipment and recommends necessary repairs. (b) Employs characteristics of recovery components in the recovery of the various naval aircraft. (c) Utilizes emergency aircraft arresting gear. (d) Processes maintenance documents and utilizes EAF system logs and records. (a) Requisitions supplies and materials required to support recovery equipment including visual landing aids. (b) Maintains an accurate and detailed maintenance and landing log. (c) Functions as a work center supervisor" or crew leader. (a) Prepares aircraft recovery equipment for storage and shipment. (b) Coordinates with other activities for the repair of recovery equipment. (c) Functions as a quality assurance representative and maintenance controller. (a) Conducts informal OJT technical training. (b) Ensures proper implementation of applicable recovery bulletins for various naval aircraft. (c) Functions as maintenance chief. (d) Advises and assists in the development of budget requirements and prepares all necessary administrative reports. (e) Conducts Tactical/Assault Landing Zone Assessment Surveys. (a) Plans, schedules, and directs the work assignments of the recovery personnel. (b) Supervises the implementation of the published safety regulations and command changes where applicable. (c) Coordinates recovery operations with other airfield operations. (d) Coordinates EAF MWSG/MAW MPF operations relating to planning, marshaling, movement, and assembly of equipment. (a) Assists in the preparation of the airfield operations manual and related operations instructions. (b) Acts as overall enlisted technical advisor and coordinator for the integration of the EAF components into the airfield operations. (c) organizes, supervises, and assists in the management of an aviation operations activity. (d) Conducts Tactical/Assault Landing Zone Assessment Surveys. Aircraft Launch and Recovery Technician 912.682-010. What Does a Marine Corps Field Radio Operator (0621) Do?